Widest plane ever takes flight! So sad the project is basically dead. They cancelled their rocket and so on. IMO this is going nowhere. I’d wager that it will be useful to someone. Anybody who’s ever played Kerbal Space Program can see the benefit of baypassing all those pesky molecules down low. Says its wingspan is longer but what’s is its weight in relation to the Spruce Goose? That’s kind of the point. It is optimized to be pretty lightweight itself so it can carry a huge payload up there. The giant airplane was made mostly of birch, not spruce, with a wingspan of 320 feet, a vertical fin of 85 feet, and a weight of 300,000 pounds. It was designed to carry 120,000 pounds of cargo, or 750 combat-ready troops, or two Sherman tanks. Its eight massive engines, with 17-foot propellers, generated over 3,000 horsepower each. It was to have a range of 3,000 miles at a speed of approximately 200 mph. The Spruce Goose weighed 300,000 lbs and was supposed to be able to carry 120,000 lbs of cargo with a total weight of 420,000 pounds. While this is supposed to carry 230,000 lbs which makes this one weigh 310,000 pounds in its full weight configuration. Weighs a bit more and is able to carry almost double the cargo. I was being a bit snarky initially since I figured the wood had to weigh one heck of a lot more than this aircraft but it seems they outdid old Howard in both arenas. You are not wrong: the old wood did weigh more than these fancy modern materials. 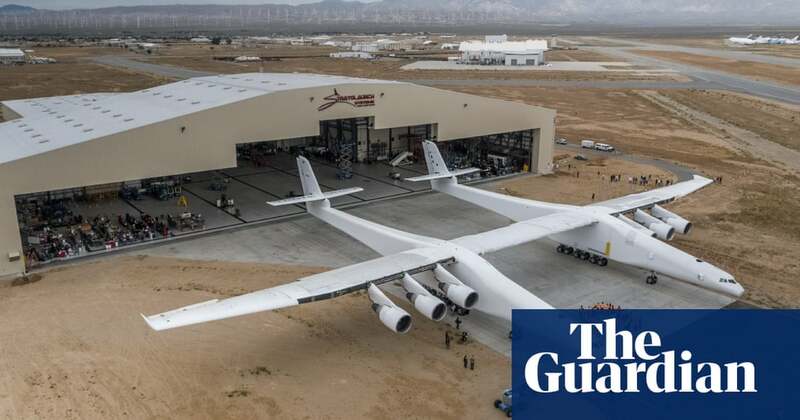 I mean, this new plane is built to take its cargo up to almost space, Spruce Goose was built to take it’s cargo from place A on ground to place B on ground. And even then, this Stratolaunch Jet does all that with Twice the amount of cargo.